The Shaving Grace starter kit is now also available at Yogis Barbershop in Cape Town. Yogi is the 4th generation of his familiy to cut Capetownians hair in this local institution. Award winning financial journalist Bruce Whitfield hosts The Money Show each weeknight on 702 and CapeTalk, offering a wrap-up of the day’s business news as well as insight into trends and expert advice on all things money-related. In last night's show Bruce interviewed Robert Bayer, Cofounder of Shaving Grace. Woodie is Shaving Grace’s new delivery van. He is a Morris Minor 1000 Traveller designed by Sir Alexander Arnold Constantine Issigonis and was built in 1961 by the British Motor Corporation. Woodie has 29 kW, a 948c cc four-cylinder engine and a four-speed manual transmission. Where does the Shaving Grace idea come from? 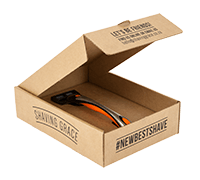 The idea for Shaving Grace came during the time the founders Robert Bayer and Stephan Feurig launched various car related online portals in South Africa. More and more consumers using websites to buy and even to sell their cars. "Over a carafe of South African Sauvignon Blanc and some pints of light draft beer we were discussing new online ideas for our website visitors", Robert explained.